The blank template can be used for any color you like, but everyone loves this classic black geek glasses look. Red or neon color glasses will look cool as well! Step 1. Print the template and cut it out. 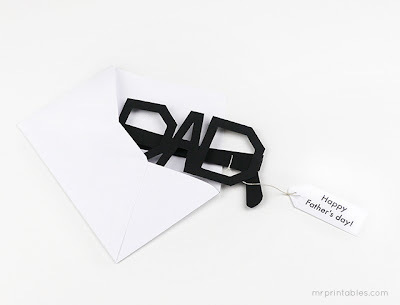 Trace it onto a sturdy cardboard of your favorite color. Cut the lines carefully with a craft knife. Step 2. Fold the tabs and glue on the arms. You can also fold them and pop them into an envelope with a message (a little tag with a message tied on) to use as a Father’s Day card. Not feeling crafty? 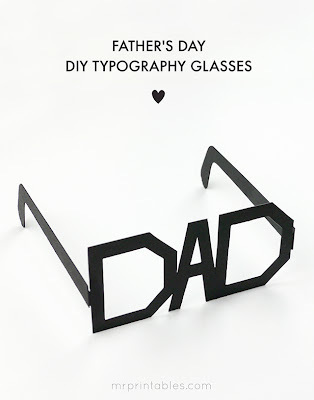 Check our Father's Day Gift Guide!